The Grand Council of Fascism (Italian: Gran Consiglio del Fascismo) was the main body of Mussolini's Fascist government in Italy. A body which held and applied great power to control the institutions of government, it was created as a party body in 1923 and became a state body on 9 December 1928. The council usually met at the Palazzo Venezia, Rome, which was also the seat of head of the Italian government. 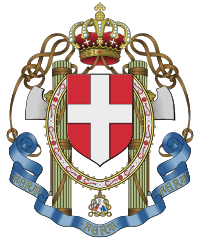 The presidents of the Royal Academy of Italy, of the special court of state emergency and defense, and those of the Corporations; Industrialists, Agriculture workers, Industrial workers and Farmers. The inventor Guglielmo Marconi was the President of the Academy of Italy, making him a council member. Various people chosen by Mussolini himself, who held 3-years appointments. The power to elect the Fascist Party deputies, the nomination for the Party Secretary and other party leaders, the approval of the party statutes and the power regarding the party's policy. The power to elect the Crown's line of succession including the choice of the heir to the throne, the right of the crown, the power to choose possible successors to the Prime Minister, the power to choose the function and membership of the Grand Council, the Senate, the Chamber of Deputies (later the Chamber of Fasci and Corporations), the power to decide the rights and powers of the Prime Minister, international Treaties, and foreign affairs. The Grand Council meetings were convened by the Prime Minister himself, and all decree and laws could only be legalized after receiving his approval. In contrast to the Führerprinzip government model in Nazi Germany, the Grand Council at least theoretically had the power to recommend that the King of Italy remove the Prime Minister from office. Therefore, it was nominally the only check on Mussolini's power. A majority of the Grand Council (19 votes against 8, with one abstention) voted, in the early morning of 25 July 1943, for Dino Grandi's Order of the Day (Ordine del Giorno Grandi) that bloodlessly deposed Mussolini following the Allied invasion of Sicily. Among the 19 deposing votes were those of Mussolini's son-in-law Galeazzo Ciano, who had been former minister of foreign affairs, and the influential marshall Emilio De Bono. Those two persons, and another three internal opponents of Mussolini, who by the help of German troops could maintain his fascist regime in northern Italy, were sentenced to death in Verona on 8 January 1944 and killed three days later.